Pokémon GO Feebas evolves into a Pokémon GO Milotic, the Gen III equivalent of Gyarados. Milotic Max CP is 2967 and both are pure water type Pokemon. In order to evolve, Feebas needs to be walked for 20 KM as a buddy. Milotic is a great addition to the metagame, however, it is not as powerful as a Waterfall Gyarados. Milotic’s added bulk makes him a bit more favorable in matchups with high damage output, but overall, Gyarados is a better option in most matchups. Milotic is another addition to the high powered water type lineup in GO. 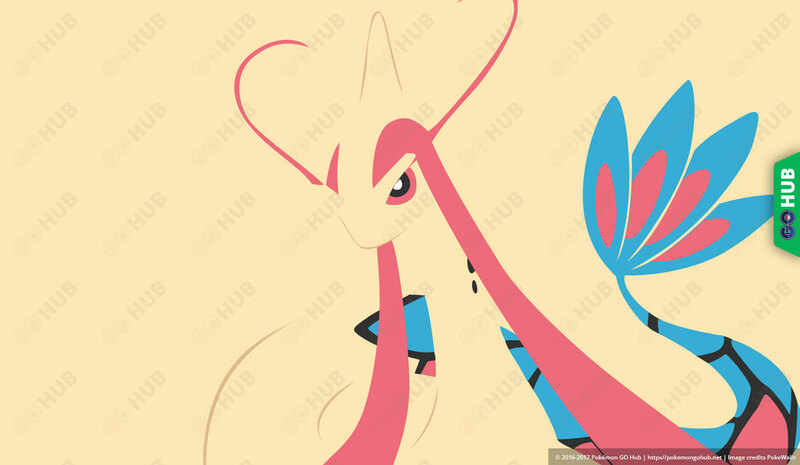 With strong stats, good move pool variety and access to Waterfall, Milotic can be a good replacement for Vaporeon and Gyarados. However, as explained below, Milotic makes for a solid Dragon slayer. Feebas is the first Pokémon that features a Buddy Distance requirement as an evolution requirement. In addition to needing 100 candy, Feebas also needs to be walked for 20 KMs before it can evolve into a Milotic. Milotic has been literally blessed with having access to Waterfall and Surf. Surf is a two bar high DPS move that works better than Hydro Pump in most scenarios, as it provides a consistent damage output, especially in combination with Waterfall. That is, if you decide to build Milotic as a Water type, not as a dragon type killer that it should be. Wait, what? Dragon Tail is arguably the best currently available Dragon move and Blizzard is simply a powerful Ice move, although we would prefer Ice Beam over it. In any case, with these two moves, Milotic can take on almost any Dragon type currently in game and win. It’s like a Lapras, but with more damage and less bulk. A normal Feebas has a light brown body with dark, irregular spots. It has pink lips, and its tail and pectoral fins are dull blue. A normal Milotic has a cream-colored body, red eyes, and long, pinkish antennae above them. It has three black dots running down either side of its neck. Its tail is patterned blue and pink, diamond-shaped scales with black outline. A shiny Feebas has a purple-blue body. Everything else is identical to its normal counterpart. A shiny Milotic has a blue eyebrows that extends to almost half of its body. Its tail is patterned yellow and orange, diamond-shaped scales with black outline. Feebas first appeared on the 349th episode of the Pokémon series (Advanced Generation: Episode 75) titled, “Whiscash and Ash”. Milotic first appeared on the 309th episode of the Pokémon series (Advanced Generation: Episode 35) titled, “Win, Lose or Drew!”. Interesting facts about this particular Pokémon family: while Milotic was so generously given the title “Tender Pokémon”, Feebas was given direct-straight-to-the-point-no-BS title: the “Fish Pokémon”.